Another Beautiful Day in Paradise. The skies were a little cloudy but no rain drops. Temperature was in the high 70s and we had a light SE breeze. Bladers/bicyclers Frank H, Ronny, George D, Mike, Jon H, Steve G, Mail Box Lady, Jim H, Dee T, Kevin M, Rob & Amy H, Carol J, Bruce M, John C, Awilda E, Lorraine L and Kim F came. Welcome all. The basic route planned was to head South, take in the fancy subdivision, do East Beach and return. 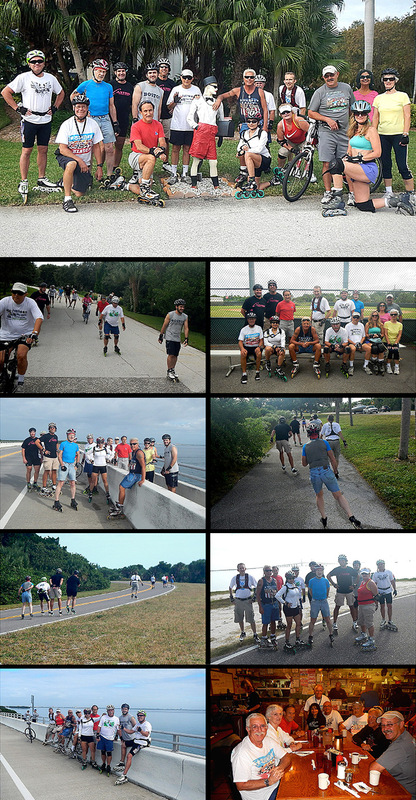 However this group was still keyed up from the Pinellas Trail Skate and decided to add in all the trails of Ft Desoto. Unfortunately we had some skate mechanical problems and one group only got in 10 miles, another group did 15 miles and most of the group did the "works" for 20 miles. What a great skate. We had 12 bladers, 5 bicyclers and the Mail Box Lady. We Brunched at Skyway Jacks as planned. We got in pretty quick and all seated at one big table. We arrived in small groups and Skway Jacks was very busy so it took us well over an hour to get in and out. Service and the food was pretty good. We had ratings from 9 to 9.5. We'll give Skyway Jacks a 9.25.